Bono has revealed how Barack Obama snubbed him at a private dinner in order to talk to Bush senior official Condolezza Rice. Bono made the remarks in an interview with Hot Press magazine in Dublin in a special Obama visit to Ireland issue. 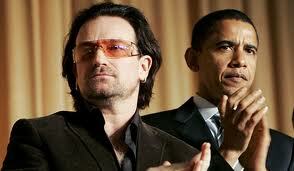 Bono says Obama has an edge on all other politicians because of his mastery of the new digital age information flow. Bono also called for a referendum on the Irish bank bailout. “That is an affront; that is an injustice to the Irish people,” he says of the fact that the Irish taxpayer had to absorb failed banks and their debt . “It would be a very sophisticated thing indeed should the Irish people demand a chance to debate and argue, and finally decide themselves, on what will in the end be a decision that will affect their children and grandchildren.”he also supports Obama's decision to have Bin Laden killed and not captured. “The lives of the women and children were, under Obama’s leadership, a critical part of the calculation,” Bono proffers. “I don’t believe it was an execution, as some have suggested. The safety of the Navy SEALs was and should be pre-eminent. Part of me would have liked to have seen a trial..."
He still believes that the troubles production of "Spider-Man: Turn Off The Dark" musical, he and the Edge wrote the music for can be a success after its' revamping. “It’s fraught with danger and then we had one very serious accident that was a real freak, the rest were just kind of the sort of accidents that happen on Broadway. But the combination made it look like we were being very lackadaisical about safety, when in fact the guy from Cirque du Soleil, who was the world’s expert, was working with us and we had really gone to every length for safety."